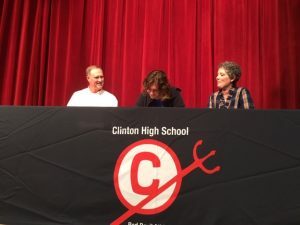 Boys Varsity Soccer · Oct 25 Freeman Signs With Tornados! Senior soccer player, Riley Freeman, signed his National Letter of Intent this morning to play soccer for the Brevard College Tornados in Brevard, NC. Freeman has been part of the CHS soccer program for four years, playing all four years for Coach John Michael Hammond, who had high praise for the senior leader. 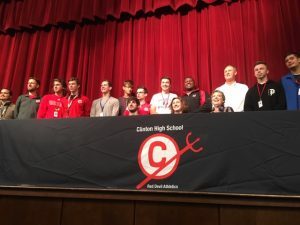 Freeman was joined by his parents, Lance and Michele Freeman, Coach Hammond, JV soccer coach, Nick Mann, as well as members of the varsity soccer team. Good luck, Riley! You may be a Tornado now, but you will always be a Red Devil! GO BIG RED!